Since I am no historian, I will just copy the information provided by the instructions, “The rapid development of aviation during the First World War was mainly aimed at improving the principal characteristics of aircraft-speed, maneuverability, and range. Structurally, airplanes of that period remained descendants of the Wright brothers' very first flying machine-they were still produced from the traditional materials of wood and canvas; structural strength was attained with the help of numerous bracing wires. But there were certain particular warplanes, some of which barely had time to take part in combat, essentially differed from all the rest-the Junkers J I, Junkers CL I and Junkers D I. These airplanes were of a completely new type. They were a great advance for there time-their design consisted entirely of metal. Their design fundamentals were simple-a framework of thin duraluminum tubes was covered with sheets of corrugated aluminum. The ingenious German designer and inventor Hugo Junkers patented this idea in 1912. It became the basis of his theoretical development "of a thick cantilevered wing". 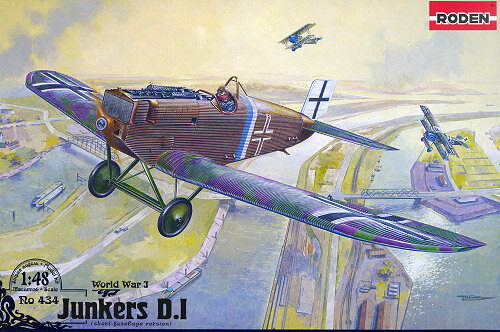 After the beginning of the First World War Junkers convinced Idflieg of the potential of his development. The Junkers J I, a heavily armored ground attack plane, made its first flight in the winter of 1916. This airplane has become famous, because none of the Allies could bring down any of these machines during the war. During the Second Fighter Competition in July 1918, Junkers entered into competition not only the J.7, but also the new J.9 (D I), with many modifications to the overall design: the shape of the fuselage was changed, the wing span was increased, and the ailerons also were of changed form. The greatest pilots participated in these Competitions, and their observations about the metal machines did appear disapproving-Bruno Loerzer and Hermann Goering recommended it strictly as "an airplane for struggle with balloons and airships". This low-wing monoplane, an unusual design for the time, naturally had a limited view downwards from the cockpit, and this also has resulted in disapproval from the pilots. Nevertheless the Idflieg ordered a series of 40 aircraft, but by the end of the war the Junkers firm had built only 15 machines (12 by February 1919, when all military production was stopped by order of the Allies). The affiliated company, Junkers-Fokker, constructed 13 machines of the D I type. The first aircraft had long fuselages (later ones were to the shorter design). In the beginning of October 1918 these machines were sent to the Flanders sector, but the war approached its end and the Junkers D I was not in time to take much part in the fighting. In conditions of autumn rain Junkers' aircraft had essential advantages over wood and linen types-metal machines were not subject to the whims of the weather, while the canvas and wood of other machines deteriorated all too quickly. I am glad to see that Roden is continuing to manufacture WWI planes as it sounds like that after Eduard releases their 1/48 Fokker Dr. I, Fokker E.III & Spad XIII kits, they are putting their production of WWI planes on hold for the foreseeable future. Roden initially released Junkers D I in 1/72 scale, both in the short and long fuselage versions. 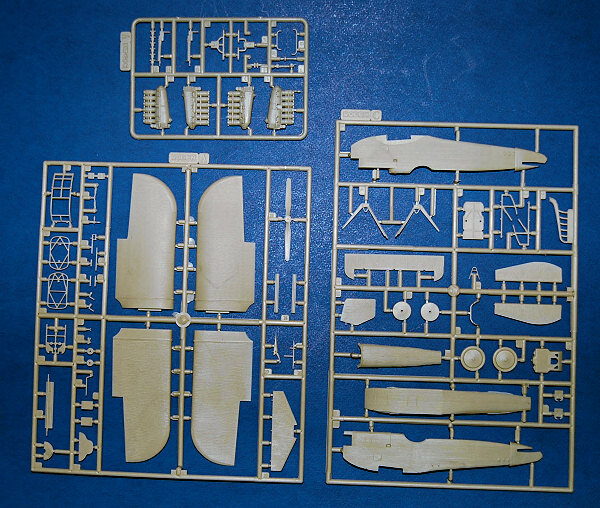 This kit represents the short-fuselage version and it is my understanding that Roden will be releasing the long-fuselage version in the near future. In comparison with their 1/72 kit, it looks like Roden did some redesigning to include additional detail needed when up scaling. The molding is typical of Roden in that there are some sink marks (in the exhaust) and some minor flash. There are also many tiny and delicate parts that you need to take care when removing from the spruce. The cockpit is very detailed as expected with their past kits. The only downside is that the cockpit sidewalls are flat, instead of rippled that would represent the corrugated aluminum body. This is not an easy correction so I will live with it. Roden supplies the same Mercedes D.IIIa engine that they use with their Fokker D. VII kits. This is great as the Roden engine is well detailed. The instructions are clear and easy to follow. The color information provided is for Model Master paints. I would highly recommend this kit to anyone wanting to build a WWI plane but are afraid of rigging and installing the dreaded second wing since neither exists on this kit.